It’s been wayyyy too long since my last tropical paradise getaway and I’ve haven’t been able to carve out time for a luxurious day at the spa since god-knows-when, but I do always find a few minutes a week to make the most of bathtime. I start by washing then conditioning my hair with Neuma. I do this because my color-treated ends can get pretty dry and, after washing, I like to condition my strands, add a few drops of oil to the ends, comb through with a wide-tooth comb or Wet brush, twist into a loose knot and let it all sit while I tend to my face and body. It gives the nourishing and reparative ingredients time to work their magic. I rinse before getting out of the bath and how thoroughly depends on how I’m styling my hair: the more curls and waves I desire, the less rinsing I do. I dig it and I also dig its refreshing minty scent (Vanilla and Peppermint essential oils). As for the NeuMoisture conditioner ($26), it’s a great detangler and also includes the proprietary UV Guard (consisting of the Phyto Colour Complex and Phyto UV Shield). I love it because it doesn’t weigh my hair down but definitely leaves my long locks smooth and repaired. It contains Shea Butter, Sunflower Seed Oil, Apricot Kern Oil and Grape Seed Extract. Lavender, Tangerine and Vanilla essential oils also add to the zen experience. 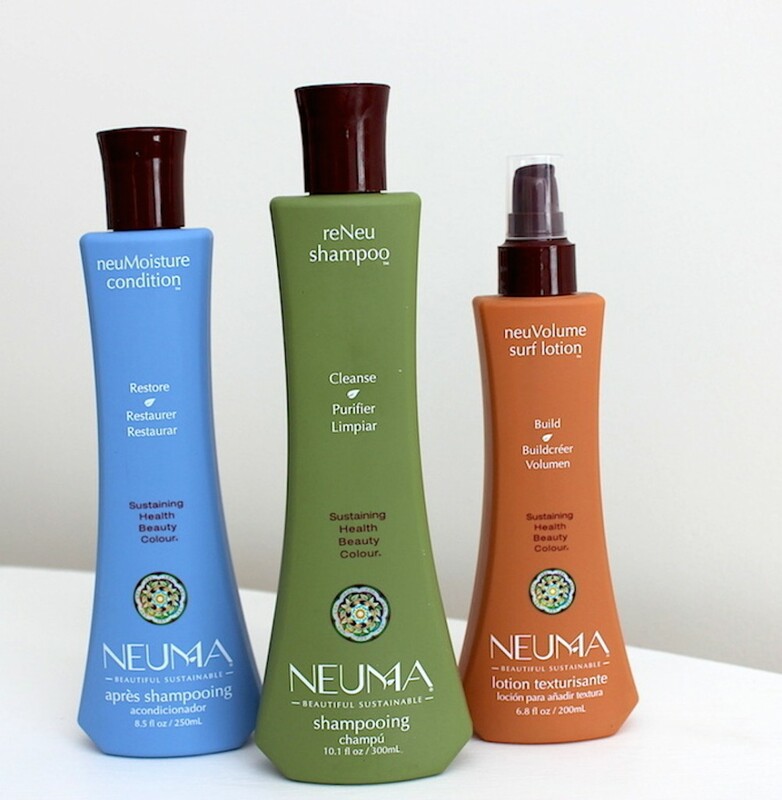 NOTE: Neuma products are vegan and cruelty-free and come in recycled containers. Extra awesome. 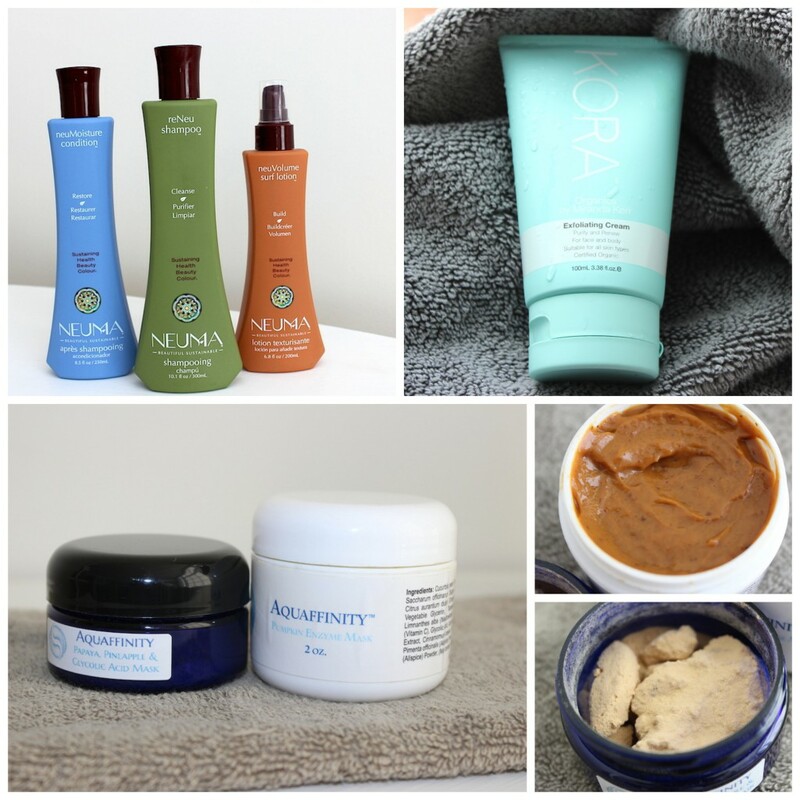 I’ve basically shouted from the (internet) rooftops that I’m a huge fan of exfoliators and scrubs and cleansing devices. I just waxed poetic about this gritty guy I love. 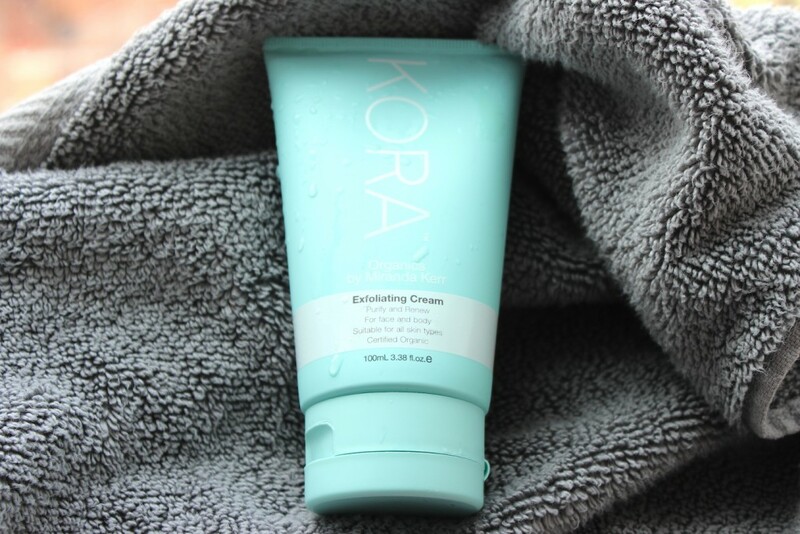 But Kora Exfoliating Cream ($58) is different. And not just because Miranda Kerr is behind it. Although I doubt that’s hurting it any! Kerr’s mission was to create pure, natural beauty products that delivered, using the highest grade certified organic ingredients. After cleansing, I love applying this cream to my face, neck, and body because it feels luxurious and soft yet ever-so-gently it’s also buffing skin with teeny tiny Oat Flour and Bamboo granules. Perfect for if you’ve gotten a touch too much sun (criminal!) — or you have sensitive skin — or you just like to indulge yourself. It also smells and feels yummy. Like a treat that you simply rinse off after rubbing all about. I am a big believer in masks. BIG. So a few times a week before the serum, and the lotions and potions, and the SPF or night cream, I layer one on. In the way that my insanely fit boyfriend insists on a varied workout to maximize results, I think switching up masks is important to keep skin fresh and to rotate benefits. I have some masks that are liquid thin and others that are thick and pasty and others that peel off in full and others that are paper sheets and still others that are only slippery when wet. In my bathtub now are these pots from Aquaffinity. 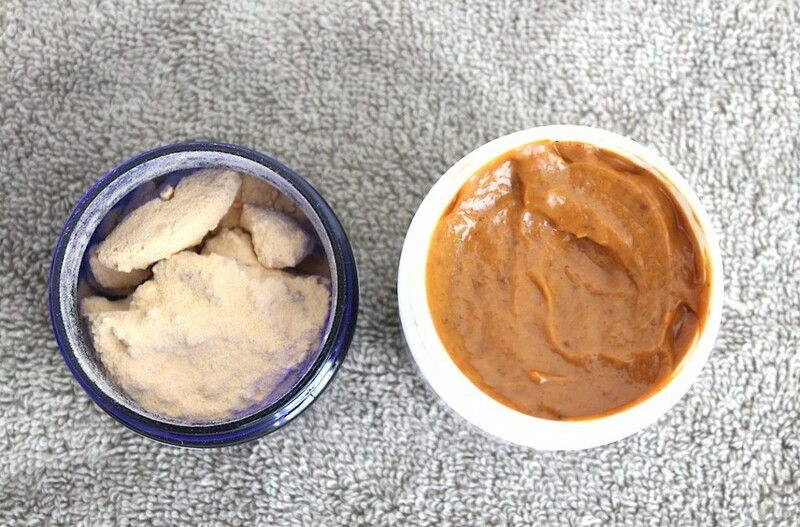 The powder is Papaya, Pineapple, Aloe and Glycolic Mask and the paste is Exfoliating Pumpkin Enzyme Mask. The powder mask ($16), once mixed with warm water, sloughs dead skin cells and leaves you with fresher, softer, brighter skin. As an added benefit – although not a product claim – I find this one tightens skin too. I’ll take it! NOTE: Use a spatula or stick to break up any “powder pebbles.” You want it smooth like sand when you whip up a small batch. The paste mask ($14) is a FALL ANTI-AGING ESSENTIAL. Rich in pumpkin antioxidants and enzymes, it increases cell renewal for smoother and younger-looking skin. It tingles a bit but you hardly notice because the scent is intoxicatingly delicious. Like autumnal heaven. I live for it. I find that when my hair has been conditioned and loosely knotted up and my skin has just been baby-buffed and then coated in a layer of epidermal love, and there is nothing but silence – not only is my exterior being repaired by my interior as well. Those rare disconnected-from-people-and-things-and-technology moments are part of my beauty routine I need more of – and bathtime affords me them. Note: This post is not sponsored. All thoughts are unbiased and my own. All photos are my own. Samples were provided for review. Ha!!!! Well put, Kel! And very true. We need more romance in our cleansing rituals.